‘Where’s My Cow?’ is a cute baby romper themed around the work of the brilliant British author, Terry Pratchett. In his Discworld novels ‘Where’s My Cow?’ is the title of a childrens’ picture book, the focus of many happy hours spent between Sam Vimes and his baby son, also called Sam Vimes! The romper is knitted bottom up, with some elements knitted in the round. It features contrast colour arm and leg edgings, integral piping (a simple technique), and a duplicate stitch motif. There is a buttoned opening at the crotch for easy access to nappies/diapers and a buttoned opening at the back neck. The pattern includes full written instructions, a diagram and table showing the finished measurements, a chart for the embroidery motif, and a clearly illustrated tutorial for crochet provisional cast-on. 0–3 months, 3–6 months, 6–12 months, 12–18 months, and 18–24 months. Main garment: two contrasting colours of a light DK/sportweight yarn. 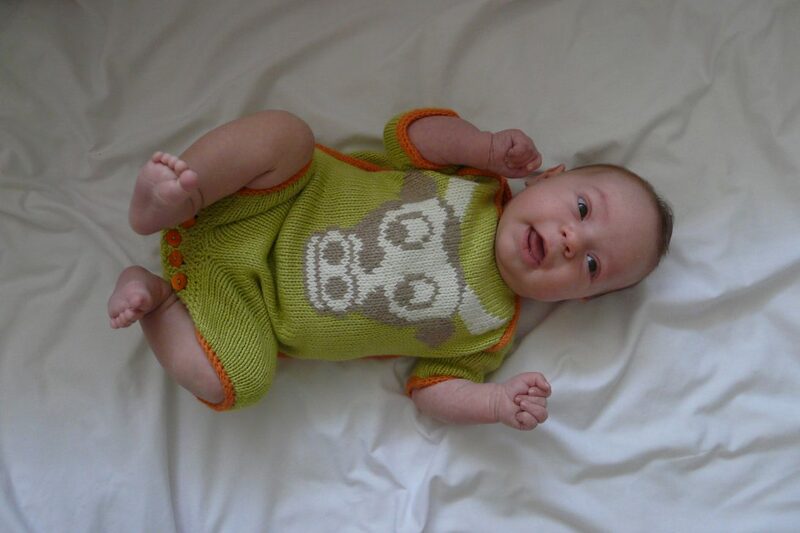 The pictured sample was knitted with Sirdar Snuggly Baby Bamboo DK in the ‘Limey’ #155 and ‘Titchy Tiger’ #100 shades. Embroidery: Approximately 12m/13yds each of a cream/white colour and a brown/black colour in a light DK/sportweight yarn. Appropriate 3.5mm/US 4 needles for flat knitting and for your preferred method of small and large diameter circular knitting. 22 sts and 34 rows per 10cm/4” in blocked stocking stitch.